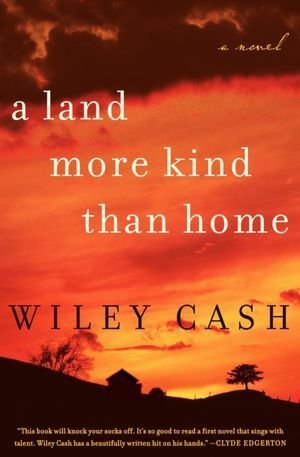 Wiley Cash did not so much ease me into the disturbing world of his novel, as grip me by the throat and pull me along. Within the first few pages I knew to be very afraid of the charismatic, snake-handling, strong-arming Carson Chambliss. I knew someone had died. I knew children were involved. And I felt the heart-wrenching isolation of the people in this Appalachian community through the eyes of Adelaide, an elderly midwife. In fact, as the novel opens, Adelaide is about to step into Chambliss’ church and meet him face to face. Cash takes a bit of a risk in starting his book right in the middle of the action without a lot of exposition to settle readers into the story; but his risk pays off beautifully. Though this is his first novel, Cash seems to have already mastered the art of unveiling a story at exactly the right pace. Using three narrators, he introduces the main players and just enough background to keep the story flowing and the pages turning. He cuts from Adelaide to Jess, a 9 year-old boy on his way to seeing things he should not see, and experiencing sorrow he should not experience. Through Jess’ eyes we learn about his brother “Stump,” a mute who is mysteriously inside that very same church. Jess’ confusion brings the emotion and heartache of this novel right up to the surface. Cash then cuts to the town sheriff, Clem, who of course has his own tragic back story to compliment to novel’s plotline. Clem is the “rational” voice of the novel, piecing together the clues and providing us with the background information we need to understand how religion and evil became so intertwined. Again, Cash makes all of this flow seamlessly. He is a gifted storyteller. But what turns this from a really good book to a brilliant piece of literature is his use of language. The Appalachian mountains come alive through his descriptions. The characters’ voices practically sing off the page. And, even when he is using the passive voice, we can feel the pain right underneath the surface of these people’s lives. Highly dramatic and deeply disturbing, this is a great book.